The 23-year-old Australian art historian is behind the “Uncomfortable Art Tours”, a series of museum visits in the capital exploring history with a twist. She focuses on what she describes as racist narratives and an ideology that underpins the objects displayed in European exhibitions from the colonial period, which isn’t always mentioned. 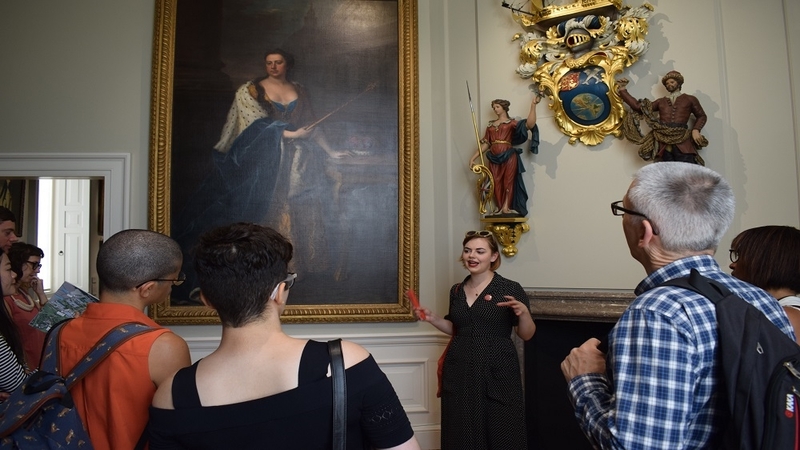 On the Queen’s House tour, portraits, botanical records, curios and engravings commemorating various European expeditions are analysed and put into context, sometimes to the discomfort of some of her tour group, who are mainly young white women – like Procter herself. Admiral Nelson’s lifelong opposition to the abolition movement, the English Crown’s financial involvement with slavery and the lack of evidence to support lurid tales of cannibalism all come as a bit of a shock. “Museums provide almost a Trojan horse type of space to confront the official narratives we’re told,” says Procter, who started the tours in 2013. Our Britishness is based on an erasure of history, and the ‘Great Britain’ narrative is based on ignoring the bad in the past. It’s important to look back to understand what’s happening now. “African heritage can’t just be in European private collections and museums,” he said during a speech in Burkina Faso, later appointing two experts, one of whom is Senegalese, to oversee the repatriation process. In May this year, Germany’s culture minister and the association of German museums released a “code of conduct” which included guidelines on how to research artefacts in collections, and how to repatriate colonial-era objects. In the United Kingdom, the director of London’s Victoria and Albert Museum (V&A) made headlines when he suggested that the museum’s Maqdala collection, around 80 artefacts looted from the palace of the Abyssinian Emperor Tewodros II in 1868 by British and colonial troops, could be returned to Ethiopia on a “long-term loan” basis. The country had filed a claim for their return in 2007. “There is great value in presenting objects from the Kingdom of Benin in a global context, alongside the stories of other cultures,” a spokesperson for the British Museum, which is part of the group, told Al Jazeera. In order for a loan to go through, the country requesting the objects would first have to recognise the institute possessing the artefacts as being their legal owner – a contentious prospect when it comes to looted art. This has fuelled concern over a potential whitewashing of the painful history behind how these artefacts were acquired by European nations during the “Scramble for Africa” in the 19th century. Writing in the Modern Ghana journal, former UN legal adviser Kwame Opoku said long-term loans represented Europe’s perceived “God-given right and obligation to supervise Africans and their activities, including what obviously is African property and resource”. Professor John Picton, emeritus professor of African art at London’s School of Oriental and African Studies (SOAS), said repatriation sets an uncomfortable precedent that no museum will easily agree to, whatever the moral considerations. Back on the Queen’s House tour, visitors are forced to reflect on Britain’s colonial past. Is Pinochet’s shadow over Chile beginning to recede?